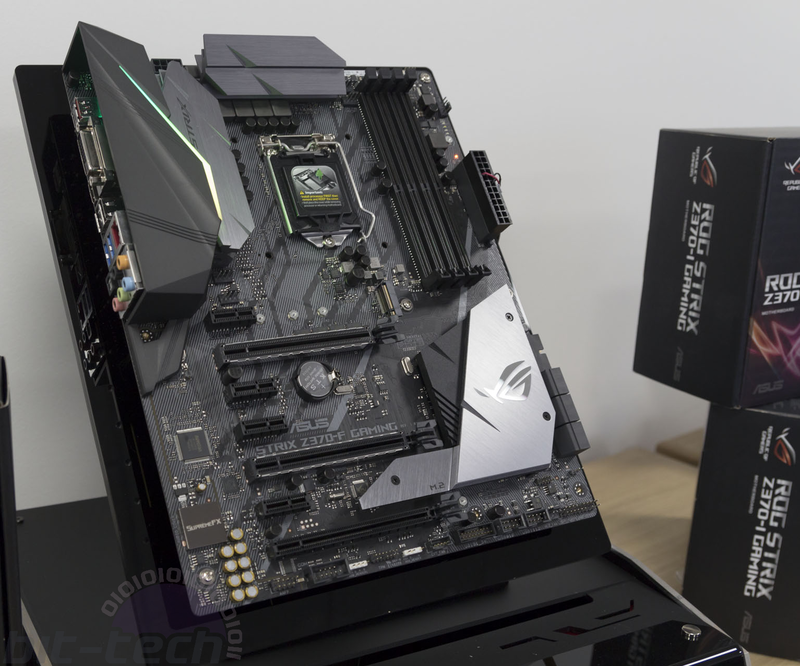 Prior to the launch of Intel's Z370, Asus invited us to its UK offices to get a taste of the new motherboard range and to help us understand how it would be marketing its four main motherboard brands now (ROG, Strix, TUF, and Prime). You can see more detail on the latest Asus range in our Z370 preview coverage. We also had the opportunity to sit down and chat with Andrew Wu, product manager for ROG motherboards at Asus. We want to extend a special thanks to Andrew for putting up with us and our questions; he was battling a sore throat induced by too many back-to-back presentations but was cordial and patient nonetheless. Thanks, Andrew! bit-tech: Can you go into more technical detail about why the new CPUs are not backwards-compatible with Z270 motherboards? Andrew: Actually, it depends on Intel’s decision. bit-tech: So it’s not a physical limitation? Intel said it was to do with power delivery. Andrew: Not really. It [the power delivery] makes a little bit of difference, but not much. bit-tech: So what are they referring to – the 20 or so unused pins from before? bit-tech: Intel has also said that overclocking has been improved with ‘enhanced package power delivery’. Do you know what that refers to? Is that also the 20 pins or something else? Andrew: Because this is a refresh platform, Intel has somehow made it even more mature, so it will be even more stable than the previous generation. From what I can see, this refresh doesn’t mean a bad thing for users. Usually, the kind of customers that already have a Z270 board will probably not upgrade for this generation. For the majority of Z370 users, maybe they have been using their PC for three or five years, so these are still good products for them to upgrade to. bit-tech: So you’re not looking to target Z270 customers, you’re looking at older customers? Andrew: We’re targeting anyone that wants or needs to buy a new system. It’s logical that many people on Z270 don’t need to upgrade. But there are still some people that would like to try these six-core processors, and they will still upgrade their systems. For users that have older systems, Coffee Lake offers great performance. You’ve got better power efficiency, higher clock speeds, the option of more cores, and faster storage. bit-tech: What frequencies can we expect to hit on air or all-in-one cooling for the six-core chips? Is 5GHz easy? Andrew: You can see how easy it was [on an Asus-controlled demonstration using a built-in 5GHz profile]! But from the samples we have in Taipei, we actually saw that more than 50 percent of processors can easily get 5GHz. That's a bit higher than the previous gen, and with more cores. If we see the same on retail samples, it shows Intel has mastered the 14nm process. bit-tech: Is it true that Intel originally planned to launch this later but brought it forward? Andrew: I don’t think I can comment on this. bit-tech: How is Ryzen doing for you guys, and will this launch impact that trajectory? Andrew: This year is busiest year we’ve ever had. We have Ryzen, and we have different kinds of platforms all launched this year. But this also makes the PC market even more interesting. When competition gets even higher, people get more options and better products, so it isn't a bad thing. bit-tech: Will pricing be on par with the previous generation or higher? Andrew: I couldn’t comment too much about the pricing, because it varies for different countries, but normally with a refresh the price will be a little bit higher because we give you extra features. bit-tech: Will Asus be supporting Thunderbolt 3? Andrew: Yes. 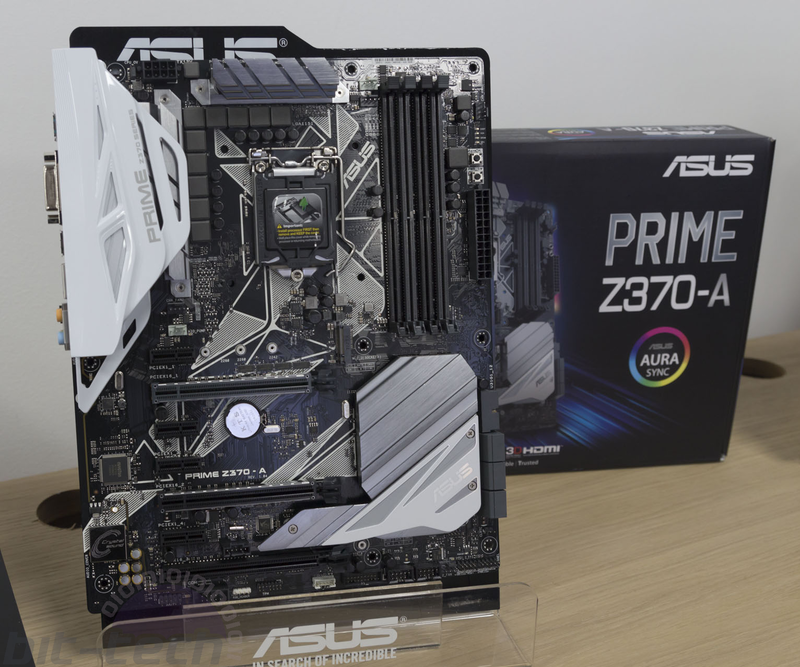 Some models like the Asus Prime Z370-A have a Thunderbolt header and support Thunderbolt 3.
bit-tech: What about PCIe RAID, is that supported? Andrew: This is one of the new things that we got from this platform. It’s very similar to the VROC, but it doesn’t require a physical hardware key. bit-tech: Do you need an Intel SSD? Andrew: They haven’t confirmed that, but to my knowledge at the moment you do, but we’ll see: If Intel faces strong competition from AMD, they may change their mind. bit-tech: What are the main features that ROG has that the rest of Asus doesn’t have. Andrew: Wow, that’s a big question, because we have a lot of different SKUs. Each model caters to a distinct user group. We have boards that are built for showcase rigs and extreme overclocking. And there are models that strike a balance between features and price. Across the entire series, we put a lot of focus on trace layout and component choices to aid overclocking. Lots of work goes into power delivery and memory trace optimization. And the ROG boards utilize dedicated microcontrollers that help work around platform limitations. Plus, there’s a lot of extra firmware tuning to ensure a smooth user experience. We’ve also got to remember that many enthusiasts consider motherboards to be like sports cars; the appearance is as important as the performance. When people buy our boards, they can expect very good performance, but we also put a lot of effort into our aesthetic design, because nowadays people always use transparent cases so they can show off their rig to others. You know, after one week travelling, everyone has been surprised by the new Formula board with its LiveDash OLED screen. We’ve used a bigger OLED panel than the previous gen; it’s over twice the size. It allows people to display their own logo or monitor system temps. Features like that are reserved for the high-end first, and if they’re well-received, we do our best to introduce them at lower price points. One example of this is the integrated I/O shield. We first introduced that on the Formula and Extreme. Feedback was very positive, so this gen, it’s also featured on the Maximus X Code and Hero. Our goal is to provide users with all the tools to explore the limitations of the platform whether it’s overclocking, the latest I/O technology, cooling, or aesthetics. All of these features and extra work add price, so that’s why the ROG boards are more expensive than mainstream models. bit-tech: There’s no USB 3.1 Gen 2 native to Z370, but will you have a USB 3.1 Gen 2 front panel header on the motherboards. Andrew: Yes, for almost every board. bit-tech: Finally, is there going to be an Impact with this series? Andrew: For this generation, no - sorry! I get asked every time about this. People like our Impact board a lot. We value this SKU very much. However, the market for the Impact is very niche, and while we enjoy pushing engineering boundaries, the Impact takes a lot of development time, so it isn't on the agenda for this round. bit-tech: Maybe next time! Thanks, Andrew. Andrew: Thank you very much. 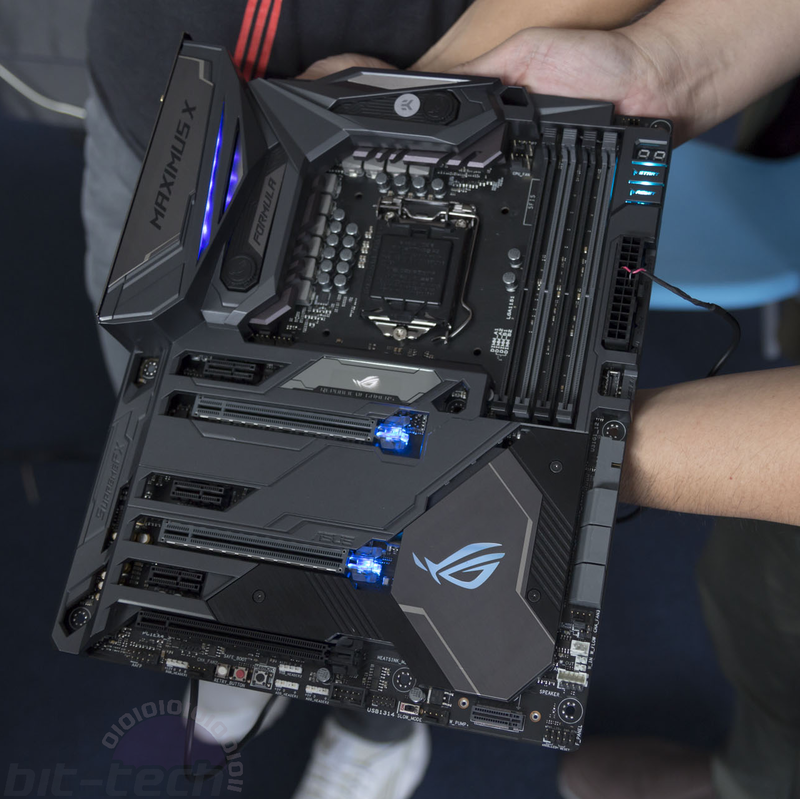 Asus' latest ROG Strix board offers dual M.2 ports, a large M.2 heatsink, RGB lighting, and Wi-Fi.